Delicious and easy to make, this healthy enchilada recipe serves four people and takes just over an hour to prepare and cook. ½ tbsp mild ground chilli powder, or a whole tablespoon if you’re feeling spicy! 1. Start by measuring all your dry ingredients (apart from the flour) and put them in a small bowl with the garlic. Keep the mix handy. 2. In a separate bowl mix your vegetable broth. Set this aside with the open can of tomatoes near the hob. 3. Pour the flour and olive oil into a medium saucepan. Set onto a gentle heat and slowly whisk until you have a smooth, lump free paste. Carefully add half the broth, keeping the rest aside. 4. Still on a gentle heat, add the can of tomatoes and the spice mixture. Keep whisking (up to 6 minutes) until the sauce starts to thicken. If it thickens too much then add a little more broth, but be careful as you may not need it all. I always tend to add a little bit at a time if the mixture gets too thick. 5. Increase to a medium heat and let the mixture simmer for another 5-7 minutes. Stir regularly and keep adding a little broth if it gets too thick. 6. Remove from the heat and gently stir in the vinegar. Add black pepper and salt for seasoning. Leave aside and continue with the enchiladas. 1. Start by chopping your onion, peppers and broccoli. Open the sweetcorn, pour into a sieve and rinse. Repeat with the black beans and put aside. 2. In a large pan warm the olive oil over a medium heat and add the onion. Sprinkle a pinch of sugar to caramelise the onion slightly. Keep stirring until golden brown. Then add the broccoli and peppers. Stir and let it simmer until the broccoli is tender. This can take 10-15 minutes. 3. Add the cumin and cinnamon to the frying pan and keep stirring your vegetables. Next add the spinach (one handful at the time) and let it wilt. 4. Add the black beans and sweetcorn. Season the mixture with black pepper and sea salt. Add ½ cup of your enchilada sauce. Leave to simmer for about 15 minutes over a medium heat until it thickens slightly. If it is too thick, add more enchilada sauce (another ½ cup). Don’t use all your sauce at this stage, as you’ll need it later. 5. Meanwhile, pre-heat your oven to 200°C (180°C for fan assisted ovens). Grab an oven dish approximately 35cm x 25cm and lightly grease it. 6. 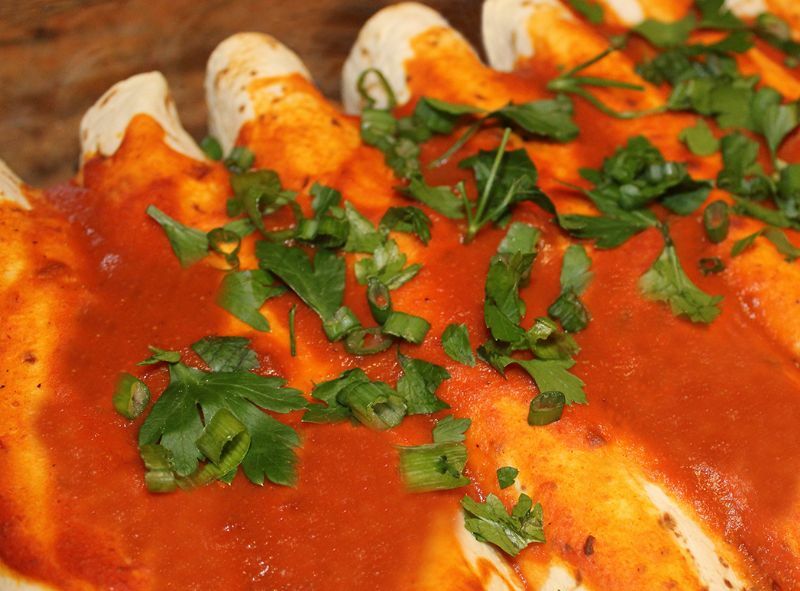 To assemble the enchiladas, pour a little bit of enchilada sauce into your prepared dish. Tilt it from side to side until it covers your dish evenly. For your first enchilada, spread ½ cup of the vegetable filling mixture down the middle of one of your wraps and gently fold the sides in to form the enchilada. Place it face down into the side of your dish. Repeat for all wraps and place them side by side in the dish. 7. Pour the remaining sauce over the enchiladas and sprinkle the cheese evenly (if using). Bake for about 25 minutes on the middle rack or until the cheese is golden brown. Start making your guacamole whilst the enchiladas are baking. 8. Once they’re done, garnish with chopped coriander and spring onion. Serve whilst warm. Note: once cool, the mixture freezes well and can be used again for future enchiladas if you make too much! 1. Mash the avocados in a small bowl. Be careful not to mash them completely – the texture is delicious if you leave it a bit chunky. 2. Chop the onion and tomatoes very finely, then gently fold into the avocado. 3. Add sea salt and black pepper for seasoning. 4. Squeeze one fresh lime into the mixture – done! Serve with the enchiladas and enjoy.